I was going through some of my personal effects and came across this piece written by Tony Scott at the Kendall County Record (I think?!) that covers some of the shenanigans we were up to back in the early aughts. I made some of the strongest connections of my career during these JoinCross.com blogging days as Chris Rhodes. Pretty incredible to think back at how far the Boss let us go with the blog. Today? They're probably right to be a bit more careful with their political image. And who's blogging today anyway?!? 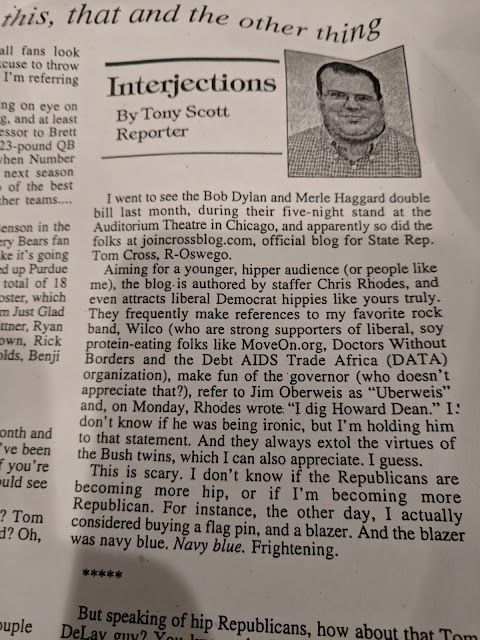 Here's post from the archives here on the blog from Dan Johnson-Weinberger that talks about the same thing Tony Scott says: those were some heady days of GOP blogging.